This week we are shining a spotlight on our amazingly talented designers' beautiful new 2017 collections and taking you behind the scenes of New York Bridal Fashion Week! We will start with the lovely Lela Rose - our latest addition to our incredible roster of world-renowned designers. Our first stop at Bridal Fashion Week was Lela Rose's beautiful presentation, held at the Pavilion at New York's famous Union Square Park. The presentation was held after a gorgeous luncheon, complete with Lela Rose's signature hostess charm. Every detail of the setting, down to the magenta deviled eggs and the pearl napkin holders, matched the exquisite attention to detail of the bridal collection. With luxurious fabrics and classic silhouettes, each and every gown brought something fresh and unexpected to bridal design. As Lela Rose is celebrating 10 years of bridal fashion, this collection unfolds the narrative of the brand's heritage and unique craftsmanship through a pearl. This iconic detail is woven through intricate embroideries, delicate trims and accessories throughout the collection. In keeping with the pearl theme, each gown was named with a nautical-inspired location where Lela envisioned the bride marrying in that particular gown. The Cape, The Tide, and The Estuary are a few examples. Her gowns once again reflect the ever evolving modern perspective of today's bide and her story in a beautiful way. The day following the presentation, we enjoyed a private viewing of the collection so we could choose which gowns to carry in store at Little White Dress. 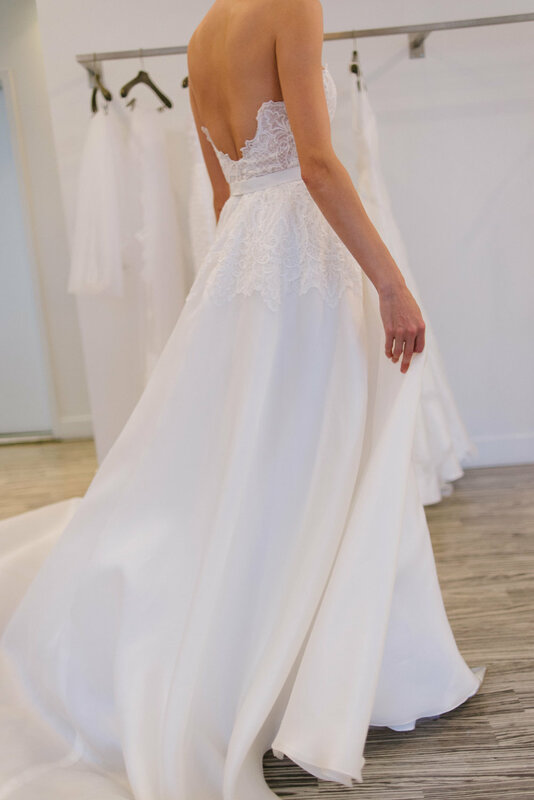 Seeing these gowns up close is such a treat, and we absolutely cannot wait to share our picks with our brides. They are truly unlike anything else available elsewhere!